It is July and the middle of summer is here with hot days tempered by a cool breeze on the coast and the chances of a wet day are practically non-existent. July's average temperature is a high 26°C with the average high/low temperatures a pleasant 21°C to a hot 30°C. The days of high 30°s are cooled by the breeze which is a welcome relief when the beach. There are many activities to occupy the long sunny days either on the beach or lazing by the pool and the temperatures are still mild in the evening to spend time outdoors. Average rainfall is still low at just 18mm falling on one day so the chances of a wet day on your holiday is negligible. With a 97% chance of a sunny day, a wet day is far off as is even a cloudy day. The breeze is still evident cooling the coastline making it pleasant on even the hottest day to be near the Aegean Sea. Sunshine hours have increased again this month to 14 hours each day, reaching up to 15 hours by the end of the month and heading into August, the peak of the year. Chances of a windy day, though is at 77% due to the onshore Miltimi Wind. Summer sea temperature is at the high of 24°C before it starts to cool again in late autumn. Swimming is lovely at the moment in the azure blue waters of the Aegean or in a pool at a local resort. Days are long for lazy days at the beach before the evening hots up with entertainment at the local bars and nightclubs. Enjoy plenty of food in July in Mykonos. The Panthea Residence is owned by the people who have the Rochari and Little Rochari and is on the hillside at Agios Ioannis and was formerly the Rochari Studios. A short walk and you will be on the beach that looks across to Delos. Studio rooms offer twin and triple accommodation with a fully equipped small kitchen, large bathroom, terrace or balcony, air conditioning and a daily maid service. Hotel Jason is located in Glastros and is just a few kilometres from the centre of the Chora. The beaches of Platis Gialos and Psarou are only 1km away. Choose from a budget twin or triple room or a studio suite for up to 3 people. All rooms are air conditioned with spacious bathrooms and TVs and some larger rooms have a small kitchen. There is free parking, car hire and a swimming pool. Explore the landmarks of Mykonos. Explore Mykonos on bicycles with Yummy Pedals and discover secluded beaches, rural scenery and discover places the others would never experience. Most touts end at the Vioma Vineyard and Winery where you are treated to some local delights. Mykonos Catamaran offer a variety of charters from overnight, all day, 5/6 hour day trip and 5/6 hour sunset trip. The 5/6 hour trips takes you to Delos and Rhenia and spend time snorkelling at 2 different locations with a full lunch or dinner served on board. The full 8 hour day trip goes to the same islands but with more time sailing around and snorkelling and swimming. An overnight trip takes you to places like Santorini, Paros, Nexus and Koufonisia. The Mykonos Town and Island Tour takes around 4 hours where you will walk and ride a bus to explore the town and island. 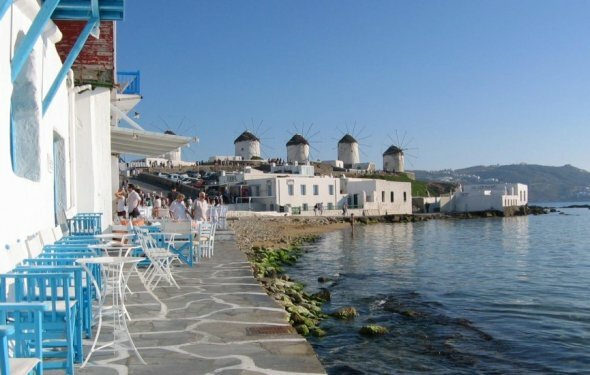 The walking tour explores the town of Mykonos, the churches, windmills, shops, Little Venice and see Petros the Pelican. The bus tour takes you further abroad to Ano Mera and the interior of the island. This tour operates on Tuesday and Wednesday and Saturday and Sunday. Earlier in the month on July 17 there is a celebration in Saint Paraskevi for the church of Agio Marina and in Skalado on July 20 is the celebration of the church of Profitis Ilias. On the 25th July is a celebration for the church of Agio Anna that takes place on the beach. Views, Bars and cafes by the sea, Mykonos. Paradise beach is for young people as it is a party beach with DJs, dance stages and lots of loud music and dancing. This wide beach is of fine gravel and there are many umbrellas and sun beds to laze on after dancing. The beach at Elia is Agrari and is a clothes optional beach and often has nudists of both sexes. There is a beach bar and water sports area for surfing and kayaking. Other nudist beaches where you can take your swimmers off are Paradise, Agios Sostis, Panormos, Fokos and Kapari. If you are after a beach to windsurf at you need one that catches the summer Miltimi Wind. Korfos Beach is 2.5 km from Chora and is not a good swimming beach but is great for windsurfing and diving. Large waves can be formed by the strong winds that make it ideal for water sports such as kite and wind surfing. There is also a dive centre here. Ftelia and Ornos are also good for wind and kite surfing. Ornos also has a diving school, windsurfing school and sea skiing school but can get overcrowded. Yes, I've been. It's ok, but its a tourist trap. Very expensive and not high quality. To get good quality in Myconos, you have to spend a fortune. Reza Taslimi is an Iranian intelligence officer (see Ministry of Intelligence and National Security of Iran) who has been involved in a number of state-sponsored assassinations of Iranian political dissidents abroad.